Learning how to improvise can be overwhelming. There’s an enormous gap in knowledge to overcome as soon as you decide that you want to play jazz. Before you even improvise a single note, you have to contend with over 100 years of musical history, from Louis Armstrong all the way up to the innovators of today. Hundreds of tunes to learn, dozens of masters to study and transcribe, famous solos to memorize and internalize… And that’s just to get to a proficient level. So where do you begin with what seems like endless information? One amount of information that is finite, however, are the four basic types of chords that you’ll encounter most frequently: Major, Minor, Dominant, and Half-diminished. If you think about it, these four chords are the building blocks of the majority of standards that you’ll come across. Dominant 7th chords comprise the harmonic body of blues tunes and the bridge to rhythm changes, Major 7th chords begin and end the chord progressions of countless standards, while minor and half-diminished chords are the first piece to the ever present ii-V progression. If you can develop language over these four basic chords in every key, you’ll have melodic material for all occasions. Of course, there are many other types of chords (Major7#11, V7#5, sus chords, minor-major 7, diminished, augmented, etc. ), but these are all essentially variations of the basic chord types, chords that you can focus on after you’ve mastered the basics. By working on the harmonic building blocks of your playing and eventually the progressions that they create, you’ll see a noticeable difference in the way you are navigating standards that used to be challenging. One similarity I’ve found between great teachers that I’ve studied with is this – they all have multiple pieces of language that they’ve gathered over very common chords and progressions. Some have a notebook filled with lines that they’ve transcribed and others have them stored in their memory after years of learning solos by ear. Either way, it seems that they all have learned at least ten lines for every harmonic situation. The first time I came across this idea was in one of my trumpet lessons when I first got into college. I was working on ii-V’s and figuring out how to navigate the ins and outs of that progression. My instructor asked me “How many ways do you have to play a ii-V.” After hesitating, he gave me a simple ii-V line and I played it back to him. “Ok, that’s one way to say ii-V, now you need 10 ways to say it.” The solution was plain and simple, but like many important pieces of advice, it wasn’t until I heard these words again that I decided I should probably start listening. The next time was from Mulgrew Miller as he was directing our student ensemble over a tune that had a half-diminished chord in a pivotal spot. Mulgrew asked one student what he had to play over that sound. 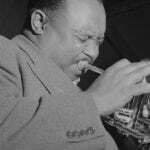 After a pause with no answer, Mulgrew said “I can think of 10 things off the top of my head to play there, not a lot, but that’s better than two.” He then showed us an example of a Charlie Parker line over that same spot in the tune, as a piece of language that he learned to navigate that chord. Once again, I was fortunate to hear the method of developing language from a master. You can’t expect to magically improvise over sounds effortlessly if you’ve haven’t worked on learning pieces of language. This concept may seem self-explanatory, but most people don’t have enough language to get them through a solo and are perplexed as to why they are having trouble coming up with lines to play. Ask yourself right now: How many ways do you have to play over Major 7 chords? What about V7 and minor 7 chords? Are you comfortable in all keys over those chords? If those are easy, do you have 10 lines you could play over half-diminished chords? If the answer is no, then having a solid base of language may be the key to your difficulties. So where are you going to get these 10 lines? From the records, of course, but keep in mind that there is no set language that you must choose from or even to conform to, it is entirely up to you. These lines define your sound, your concept, and your identity as a musician, so make sure they are meaningful to you. If you copy the same lines that everyone else is learning, you will sound like everyone else. You should be the person deciding what you want to sound like, not a book, a teacher, or even a peer. Some schools have a philosophy of teaching the same lines to every student in an improv class. Certain books give you specific lines that you must learn in order to be a “true” jazz musician. If all musicians learned like this, everyone would be using the same material for every solo. We don’t want to have a bunch of musicians that all sound like musical clones. Like the masters of this music, the musicians that we remember are the ones that were unique individuals. This is where the individualism of the artist comes into the music – you must find your own influence, your own path to artistic expression. When you first hear it, ten lines doesn’t sound like a very large amount. You probably know ten licks right now, but can you play them in every key or can you use them in a variety of ways? Ten lines for every chord type, when you actually get to work learning them, is a deceptively large amount of information. 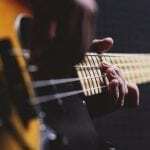 With ten unique ways to navigate a chord or progression, you’ll have a solid start to soloing on any standard confidently. As you choose these lines from solos that you’ve transcribed or ones that you hear off of records, remember that the line doesn’t have to be complex or long, just a musical idea that you like. Ok, that is one line over Maj.7, now you need to find nine more. You can see how this process quickly adds up to a lot of information…and remember, that was just for Maj.7 chords. The goal is to have ten lines over each of the four basic chord types. This is the step-by-step process by which you’ll incorporate the language from the records into your playing, eventually developing your own musical personality. By starting with a model of a great line from one of your favorite players, you are not only gaining vocabulary which you can use, but also developing a method by which you can create your own language. This whole process may seem counter-intuitive. As jazz musicians, aren’t we supposed to be developing our own sound, our own ideas, our own unique harmonic concepts – not stealing lines verbatim from other players? Yes, this is the eventual goal, but you must start, as all great musicians do, with a model; so why not make it an exemplary one. Part of the struggle for beginning improvisers, is that they are trying to create melodies and navigate harmonies without having listened to and studied the art of what it is to create a truly great line. Approaching improvisation from the standpoint of theory and scales, rather than musical phrases and lines. This is similar to a novice writer trying to write a great sentence without having read any classic novels or works of master writers, essentially struggling to create something out of thin air with no tools or vision. By having language that you’ve gathered from the records by ear, you have a starting point from which you can begin a line or, when you’re stuck playing over an extremely fast tempo, you have a line that you can execute under pressure. If you do the work and get these 10 lines over each chord you’ll actually have tools to work with, instead of having to re-invent the wheel every time you play a solo. 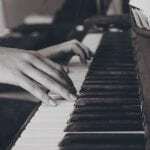 If you listen to your favorite improviser over period of time or from multiple records, you’ll notice that they have certain lines that they frequently use over various tunes or progressions. Most of the time these are lines or concepts that they have developed on their own. You can be sure, however, that these lines were inspired by and modeled after lines that they learned from records. These exercises for single chords are only the starting point. Once you’ve got your ten lines to play over these four types of chords, it is the time to approach common progressions. For some ideas of where to start, check out this article on visualizing chord progressions. Keep in mind that you’ll use the same process for learning lines over progressions as you did for these basic chords. With a concrete way to develop language and improve your lines, you’ll be able to navigate any progression that comes your way.